29th August, Arlington, Texas: The Teen Masters first challenged America’s top teen bowlers in 1997, making it America’s longest running national championship youth bowling event. Now, the rest of the world’s top 18 & Under bowlers also will have a chance to take on bowling’s toughest test November 9-11 at the 2012 Teen Masters World Series in Las Vegas. Certified by the World Tenpin Bowling Association and held in conjunction with the Professional Bowlers Associations World Series of Bowling IV, the 2012 Teen Masters World Series invites the WTBA’s 100+ member federations to send their best teen bowlers to Las Vegas to test their skills against like-aged competitors from other countries and to be part of one of the PBA’s most exciting signature events. Killer ‘B’ Promotions founder Gary Beck started the Teen Masters in 1997 as a unique youth tournament designed to test player skills. That insistence on a high level of physical performance and mental fortitude continues today. Competition takes place on a combination of long- and short-oiled lane conditions, and with limitations on bowling equipment which require players to make adjustments in their techniques rather than relying on ball technology. Each competitor in the 2012 Teen Masters World Series will be allowed to use two specific Ebonite bowling balls – the Innovate and the Cyclone – plus a plastic spare ball. Medals will be awarded in separate boys and girls divisions. All PBA WSOB IV competition will be hosted at the South Point Hotel and Casino in Las Vegas, which is also serving as the Host Hotel for the Teen Masters World Series, a Teen Masters/PBA World Series Pro-Am on Wednesday, November 7, and the television taping of the Teen Masters World Showdown on Saturday and Sunday, November 10-11. The Red Rock Bowling Center, home to the PBA Tournament of Champions for the past 5 years, will host the Teen Masters competition November 9-11, plus an optional Plastic Skill hallenge event on Thursday, November 8. Free transportation for the Teen Masters competitors will be provided between the South Point and Red Rock locations. 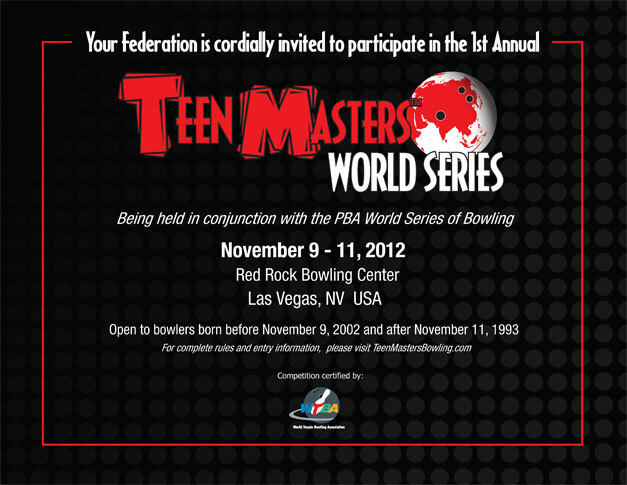 Entries are now being accepted online via TeenMastersBowling.com until Oct. 15. The field for the Teen Masters World Series is limited on a first-come basis to the first 120 players who enter.